If you're adding a classification to or replacing the qualifier for an existing license, be sure to use the correct CSLB form to avoid accidentally paying higher, non-refundable fees – and delaying your application in the process. The fee to add a classification or replace the qualifying individual on a license is $75. However, CSLB is finding that an increased number of applicants are mistakenly turning in the Application for Original Contractor License form, along with the $300 fee. The application for an original contractor license results in a new license; it does not modify an existing license. In addition to the lost time and money, licensees whose application was rejected but still want to add a class or change a qualifier must start the process again by turning in the correct forms – and the $75 fee. Anyone who plans to become a licensed contractor can benefit from a CSLB webcast that clarifies the experience verification process that all applicants must undergo to qualify for a license. The two-and-a-half-hour session reviewed acceptable types of experience and the most efficient ways to document work that supports an applicant's claimed journey-level experience. 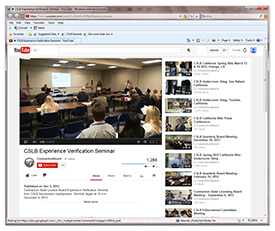 Better understanding of the experience verification process enables CSLB Licensing staff and licensing schools to work together to help applicants streamline their application process and begin their careers.